Members of the community came together to pack and deliver lunches Wednesday, based out of Elizabeth Chapel on Third Avenue. GALLIPOLIS — Local citizens of Gallia County have banded together to help raise funds, and awareness for suicide prevention. 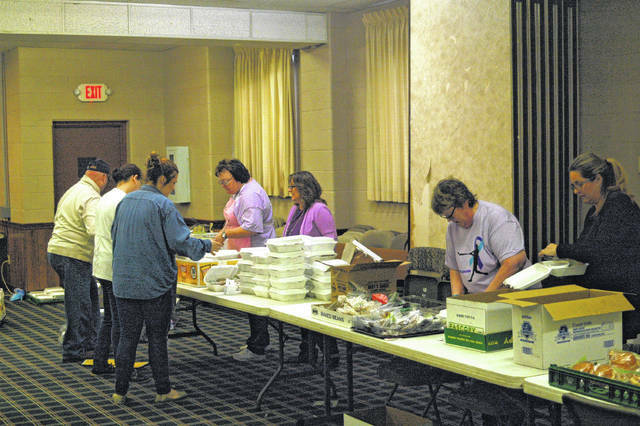 Rose Sipple, along with her family and the support many others in the community gathered together to prepare meals for sale that were delivered Wednesday for lunch. After it was all said and done, over 500 meals went out the door bringing in more than triple the expected goal of $3,000. Several businesses and schools in the area purchased meals for delivery, which volunteers dropped off once they were packaged. The group, which is not associated with any particular entity, based out of Elizabeth Chapel Church on Third Avenue. ECC was chosen for its central location in town. “We’re grateful Elizabeth Chapel was kind enough to let us use their church,” said Sipple. The food was largely donated from numerous individuals. Andy Hout slow roasted the pulled pork, which was served with baked beans, chips, baked goods, and water. “I want to make a difference. If we can prevent at least one child from committing suicide, so another family doesn’t have to go through what we did that will be worth it,” said Robin Hatfield, one of the many volunteers. Over forty people helped pack and deliver lunches all over Gallia County, including friends of the Sipples, church members from Good News Baptist Church, and coworkers from Ohio Valley Bank. The group is also working to raise funds through the Out of Darkness Campus Walk Saturday April 14. The Sipples are on Team Chief, named after Anthony Sipple (also known as Chief). Learn more about the walk at www.afsp.org/Rio.